From October 3-5, 2012, the Commission of Truth presented its report, “The Voice of Greatest Authority is that of the Victims,” about human rights violations in Honduras during and following the June 28, 2009 coup d’état. PROAH accompanied the Commissioners when they presented the report in Tegucigalpa, San Pedro Sula, and Tocoa. The Commission of Truth was created in June 2010 with the objective of “clarifying the facts of the June 28, 2009 coup d’état to demand justice for the Honduran population affected by the coup d’état and to recommend the adoption of measures necessary to avoid the repetition of this type of event in the future.”i The Commission was created by human rights organizations as an alternative to the Honduran government’s Truth and Reconciliation Commission (CVR). 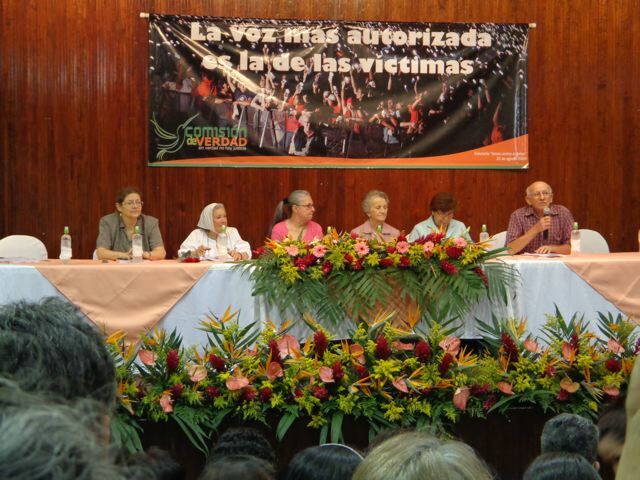 According to Bertha Oliva, Coordinator of the Committee of Families of the Detained and Disappeared of Honduras, the CVR report, which was released in July 2011, “makes the victims invisible and gives a layer of protection to the assassins.” Restoring dignity to the victims was an important part of the mandate and focus of the alternative Commission of Truth. The Commission of Truth is made up of well-known national and international human rights defenders. 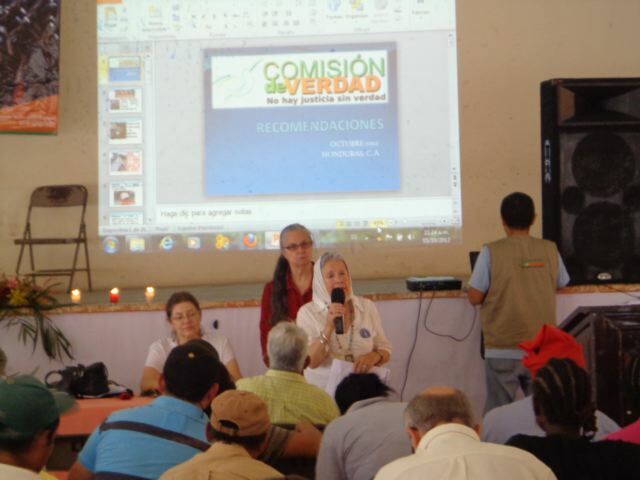 Six of the commissioners presented the report, including the President of the Commission, Sr. Elsie Monge, who also presided over the Truth Commission in her country of Ecuador. The two Honduran members of the Commission, writer Helen Umaña and Fr. Fausto Milla, known for his many years of work defending human rights in Honduras, were also present. Nobel Prize winner Adolfo Pérez Esquivel sent a representative on his behalf, Beverly Keene of Jubilee South. Two Commissioners shared their own experience of family members being disappeared or murdered: Mirna Perla, a former Supreme Court Justice in El Salvador who survived a massacre in 1975 and lost her husband in a political assassination in 1987, and Nora Cortiñas, whose son was Detained-Disappeared in Argentina in 1977, which motivated her to co-found the Mothers of the Plaza de Mayo Movement. 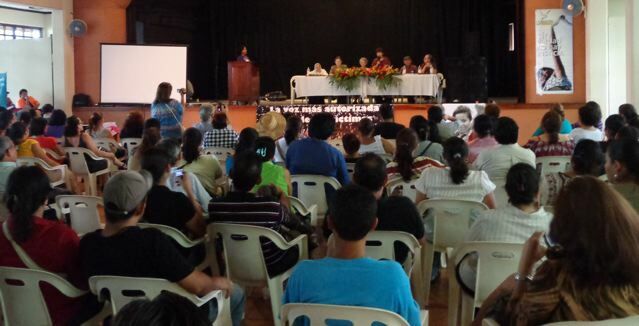 At the first presentation of the report, on October 3 in Tegucigalpa, the Commissioners presented the report to victims of human rights violations, the families of murder victims, members of organizations and social movements, the press, and representatives of the Honduran government and several Embassies. Those who lost their lives in the struggle for justice following the coup d’état were remembered and made present in the memory of all those in attendance through a moving ceremony in which a large photo of each person was carried to the center of the auditorium as their names were read and the audience members responded presente. The first copy of the report was presented to the parents of Isy Obed Murillo, who, at 19 years old, was the first casualty of the coup d’état. On July 5, 2009, he was shot in the head and killed when the military opened fire on a protest at the Toncontín airport, where President Manuel Zelaya was attempting to return to the Honduras. 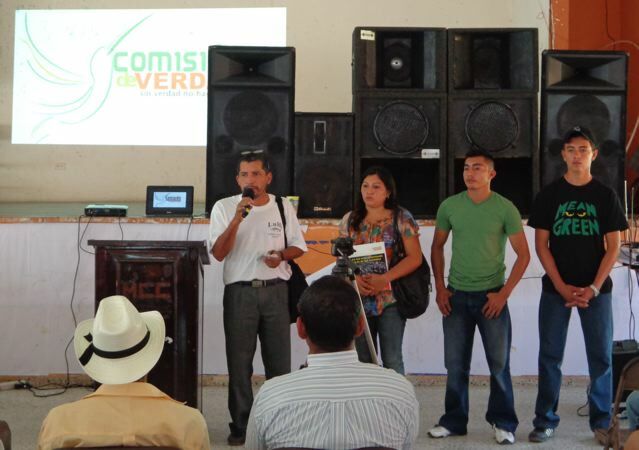 At the presentation of the Commission’s report in Tocoa, a city in the Lower Aguan region of Honduras, the commissioners presented a copy of the report to the family of Gregorio Chavez, a small farmer who disappeared on July 2, 2012 and was found dead four days later on the property of businessman and palm oil producer Miguel Facussé. He is one of over 50 people related to or affiliated with campesino organizations in the Lower Aguan region that have been murdered since the coup. In Tocoa, the commissioners and attendees also took a moment to remember Antonio Trejo, the lawyer for the MARCA campesino movement in the Aguan who fought tirelessly in court to defend the right to land for campesinos. After receiving several death threats, he was murdered on September 22, 2012. After the presentation of the report, those in attendance also had the opportunity to share with the commissioners about the repression that campesinos and human rights defenders continue to face in the Lower Aguan region. The first two patterns were clearly illustrated during the remembrances of those who had been murdered, kidnapped, and abused during protests or for being journalists or leaders in the movement against the coup. To illustrate the third pattern of institutional dysfunction, particularly the “dysfunction in the justice system,”v the commissioners presented the report in San Pedro Sula to Judge Luis Alonso Chevez de la Rocha of the Association of Judges for Democracy, who is one of the judges removed from office for opposing the coup d’état. The Commission of Truth’s report notes that they received “information about the removal, arbitrary transfers and dismissals, and the subjection to disciplinary hearings of an important number of judges who expressed their rejection of the coup d’état.”vi The commissioners noted that the right to a fair trial requires independent and impartial judges and that the ability of judges to be independent is important in ensuring respect for human rights. This entry was posted on October 22, 2012 at 12:46 pm and is filed under HAP Articles. You can follow any responses to this entry through the RSS 2.0 feed. You can leave a response, or trackback from your own site.